Tucked in among my many "firsts" of daily activities without Kaya (like just tonight, I realized that sweet potato peelings now go into the compost pile instead of being eagerly devoured by Kaya along with the extra sweet potato I always cooked for her) was a visit at the farm this afternoon from a small flock of five Eastern bluebirds. I look for them every single day that I am at the farm, but I have not seen them for weeks and weeks and weeks. As the group flitted about the backyard, one of them landed in the tree branch closest to the window where I was standing, taking a break from finally cleaning the kitchen cabinets at the farm to watch the backyard bird feeders. While 4 of the 5 did normal bird things, this one sat and sat and sat looking in the window where I saw standing. Seeing bluebirds always brings to mind the expression "bluebirds of happiness" and my heart always leaps and I always smile when I see them, without fail. Yes, I felt my heart leap and my face smile today, something that has been scarce this past week, however, I then realized that I was also crying some tears of sadness, too. Not buckets, just a few this time. I hope that bluebird came to tell me that Kaya is missing us but happy, enjoying her pain-free existence, her freedom to run as fast as she can to chase a frisbee or a chipmunk without lame back legs and hips, to swim in Blue Lake, and is even enjoying an endless supply of sweet potatoes, one of her favorite foods. The next time I see our small flock of bluebirds, I think I'll be able to watch them with only happiness in my heart and mind. And as soon as the snow melts and the ground starts to thaw even a little, putting our bluebird poles and boxes up will be "job 1". Having them nest on our farm will bring daily happiness. I'll never get tired of seeing them, and I will enjoy remembering the one who came to tell me of Kaya's happiness, too. 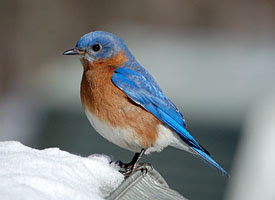 I believe your hope is true -- that little bluebird was a messenger. Kaya is at peace. She hopes you will be, too. Your relationship _is_ real, very shabby (in the beautiful sense of the word) & eternal. I don't have words but please know my heart is trying to hold some of your sorrow.